How far away are we from the Battle of Armageddon and what will happen between now and then? The prophecies of the Bible clearly foretell the major events that will come to pass over the next few years. In the first lesson of this series, we give an overview of the major events that will occur from now until the Battle of Armageddon and the Second Coming of Jesus Christ. After the overview, we explain each major prophecy in detail. We give the location of the prophecy, explain what it means and show how world conditions are presently converging for the fulfillment of that prophecy. God did not intend for His people to stumble blindly through the end times. These things are clearly described in this exciting series. The lessons in this series are as follows: Lesson 1 - Timeline of Events Lesson 2 - 6th Trumpet War Lesson 3 - Final 7 Years Lesson 4 - Israel's Third Temple Lesson 5 - Antichrist Revealed Lesson 6 - 666—The Mark! 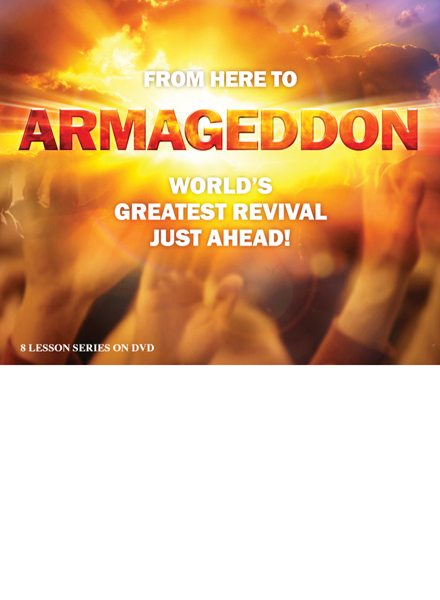 Lesson 7 - Armageddon Lesson 8 - World's Greatest Revival—Just Ahead!